Modern media is flooded each Thanksgiving with tales of the myths and distortions of America’s most widely celebrated holiday. That is the most amazing thing about Thanksgiving. It is full of ironies and falsehoods and ignored facts. On one extreme you have those who cling to the Charlie Brown version of Thanksgiving. This is what most of us were taught in grade school – that the pilgrims walked off the Mayflower, made nice with the Indians and enjoyed a festive meal. On the other extreme you have those who say the Thanksgiving at Plymouth of 1621 never happened at all – that it is a total myth. 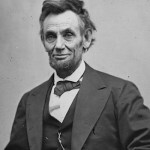 Yet one other extreme exists: that Thanksgiving never really existed until Abraham Lincoln was convinced it was something to rally the country around during the Civil War. All of these extremes are wrong. The surprising truth of Thanksgiving should make you smile and want to celebrate it all the more. The truth, as always, lies between the extremes. First, realize that there was NO Thanksgiving in 1621. Sure enough there was a Thanksgiving that happened but it wasn’t that first year, fresh off the boat. The “first” Thanksgiving was actually around 1623. A big point? Not really. But it is a clue about the idea of Thanksgiving in the first place. Thanksgiving didn’t just happen. It was usually “declared” but some authority. In England – where every last one of those Puritans came from – a “general day of Thanksgiving” was declared whenever there was shared good news. It might happen because of a victory in battle or because of the birth of a new royal baby. In other words, Thanksgiving days were days people of the 17th century were used to celebrating at any time of the year for a variety of reasons. So whether “the first Thanksgiving” happened in 1621 or not is hardly what is important. Thanksgiving to them was not a new idea. What is important is that, yes, it DID happen and for the very reasons we were taught in school and by Charlie Brown. Thanksgiving was celebrated to acknowledge the hand of God in the good fortune of having survived the early days of the pilgrim settlement. And yes, the Native Americans were there. Nowhere is Thanksgiving better showcased in history than in the media. The earliest printed reference to Thanksgiving we have found comes from a 1690 publication called Public Occurrences. It talks about Thanksgiving among the Christianized natives. By this time in history in North America Thanksgiving had been celebrated every harvest season – and many other times during the passing years as accomplishments were celebrated. Almost always they were celebrated with food and time off from working. 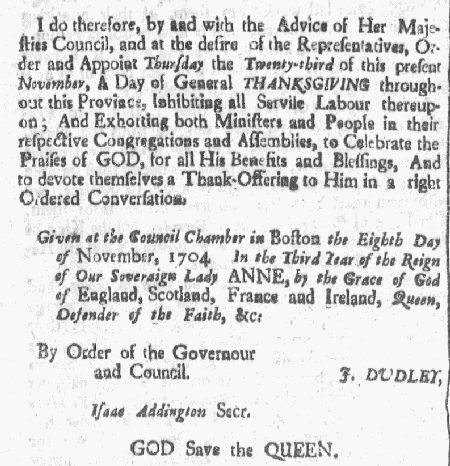 From the Boston Newsletter of 1704, comes the annual declaration of a general day of Thanksgiving – by now a well-established and beloved tradition. The emerging technology that allowed for the printed word to be distributed as “news” was just starting in America in the early 18th century. 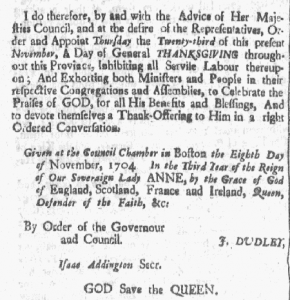 While many references to Thanksgiving from this era can be found they are usually notes from courts where public proclamations were made – and then published in these small, local publications. Word spread from one place to another as newspapers of the time would reprint news gained from other news publications. Thanksgiving makes a frequent appearance throughout the 18th century media at various times of the year. These proclamations always acknowledged God, called people to attend church, and forbade work on Thanksgiving days. The working life of early America did not allow for many holidays. 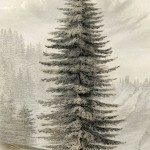 In fact, the notion of singular days of observance were very rare. That is why they needed to be “declared”. Many historians, as we have seen in their insistence that Charles Dickens “invented ” Christmas, discount events that are not “official” as a matter of practice. But that does not mean these events did not happen. Much of everyday life can be gleaned from the early newspapers of America. 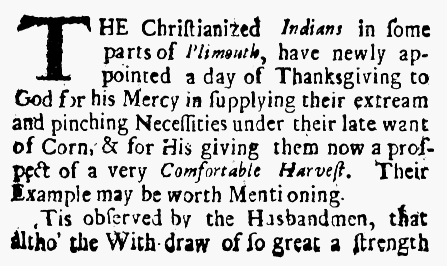 This note in the December 7th edition of the New England Weekly Journal of 1736 gives us a glimpse of what Thanksgiving was like then — while reporting on the news of a tragic event. Again, this is news much as it would be published today. As time marched on Thanksgiving became not only a time to attend church and to acknowledge God. It was a time to be cherished from the past. Thanksgiving was a huge marker during the year. Many people celebrated the “annual Thanksgiving” (the one in November) as kind of a year end tradition. It celebrated the end of one season and the start of another. Good times were had and memories were made. 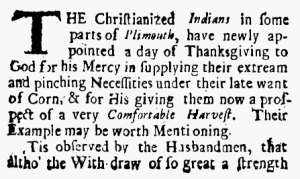 This amazing advertisement from 1747 is symptomatic of how Thanksgiving was looked back upon nostalgically — even then. 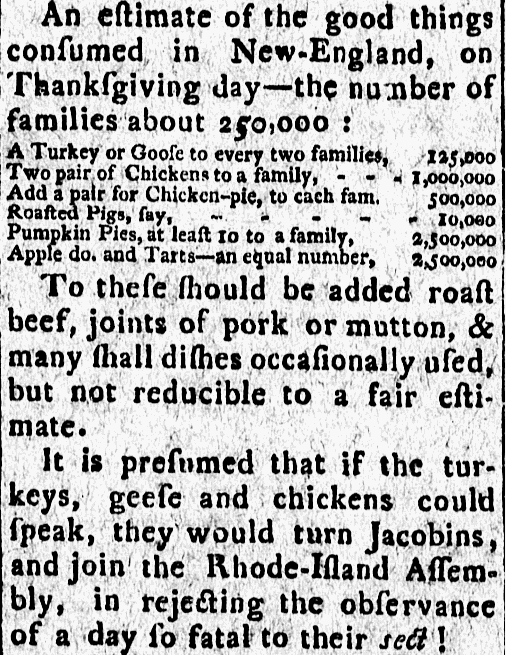 This advertisement appeared in the Boston Post Boy of January 5th, 1747 selling a history of sorts of Thanksgiving in America. From an amazing Boston publication from 1801 we get an article that could have been written today. It estimates the amount of food consumed at the annual Thanksgiving feast. Note the number of pumpkin pies – at least 10 to a family! By this time Thanksgiving was well established in every US state. The routine was always the same – awake in the morning to huge, traditional breakfast made special with pies. Then attend church. Then return home for the main feast and an evening of visiting with gathered family. 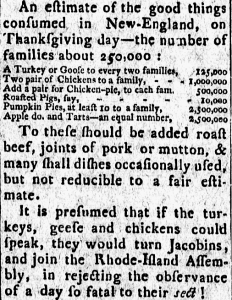 As you contemplate these early American news clippings consider this: Thanksgiving was not officially made a holiday until 1870. 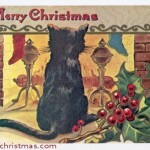 But just like Christmas it was observed with passion and tradition. 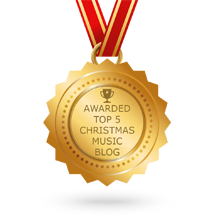 Editor’s Note: This is the first of a series of historical Thanksgiving features to be presented here on MyMerryChristmas. 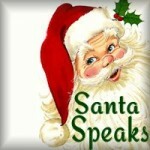 For more information, take a listen to this episode of the Merry Little Podcast.